Trego ointment: Each gram ointment contains Mupirocin BP 20 mg .
Mupirocin is a topical antibacterial agent, active against those organisms responsible for the majority of the skin infections, e.g. Staphylococcus aureus, including methicillin-resistant strains, other staphylococci and streptococci. It is also active against Gram-negative pathogens, such as Escherichia Coli and Haemophilus influenzae. Mupirocin is bactericidal at concentrations achieved by topical administration. However, the minimum bactericidal concentration (MBC) against relevant pathogens is generally eight-fold to thirty-fold higher than the minimum inhibitory concentration (MIC). 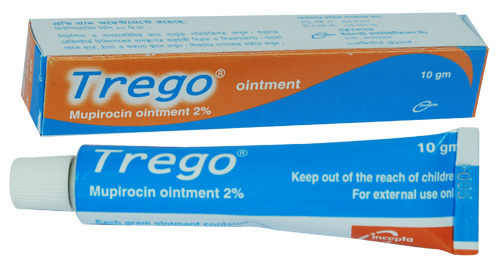 Trego ointment is indicated for the topical treatment of impetigo due to Staphylococcus aureus and Streptococcus pyogenes. It is also indicated in folliculitis and furunculosis. For children and adults: A small amount of Trego ointment should be applied to the affected area three times daily for up to 10 days. The area treated may be covered with a dressing if desired. Mupirocin is not suitable for ophthalmic or intra-nasal use. When Mupirocin ointment is used on the face, care should be taken to avoid the eyes. In common with other polyethylene-based ointments, this drug should be used with caution if there is evidence of moderate or severe renal impairment. As with other antibacterial products, prolonged use may result in overgrowth of nonsusceptible organisms, including fungi. Use in Pregnancy: Because animal studies are not always predictive of human response, this drug should be used during pregnancy only if clearly needed. Use in lactation: It is not known whether this drug is excreted in human milk. Because many drugs are excreted in human milk, caution should be exercised when Mupirocin ointment is administered to a nursing woman. The safety and effectiveness of Mupirocin ointment have been established in the age range of 2 months to 16 years.